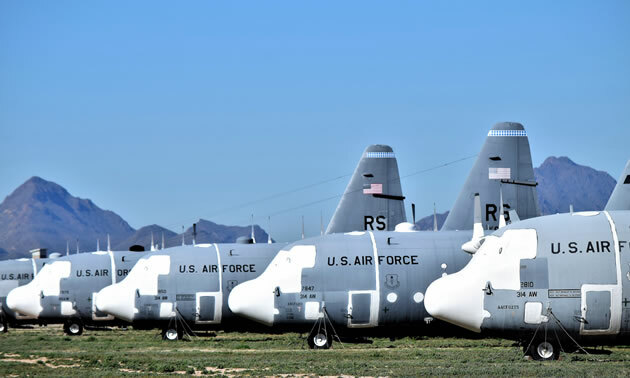 Aside from golf, another attraction at the Air Force Base is the 'largest aircraft boneyard in the world," home to more than 4400 obsolete planes and aircraft. During my golfing life, I have golfed on more than two hundred courses. Some courses were average, some were used by the PGA Tour, while others could best be described as a cow pasture. Regardless, all courses are worth playing because golf is golf, regardless of the price of green fees. Recently, I had the opportunity to play on a military base, the William Blanchard Golf Course, located on the Davis-Monthan Air Force Base in Tucson, Arizona. Established in 1925, the AFB hosts the 355 Fighter Wing, assigned to the Twelfth Air Force and forming part of Air Combat Command [ACC]. That sounds very impressive to us non-military people. More impressive, however, is to learn that this base is used to train the pilots for the A-10 Thunderbolt II. When the pilots have finished their training, they are deployed to Iraq to fight in the war against ISIL. The A-10 was originally designed for air to ground combat against tanks, but has proven to be very effective in bombing ISIL buildings and positions. It is daunting to have an A-10 roar over your head while you are trying to concentrate on putting. The William Blanchard Golf Course is not a public course, regardless of who you are. An invitation to play must be extended by a member on active duty, a reservist or retired personnel. Approaching the main gate for the first time, I was quite apprehensive as the guard checked I.D. and asked some pertinent questions. It felt similar to crossing the US-Canadian border, but with a little more serious consequences. On entering the AFB, the first thing I noticed was a large RV Park for military snowbirds who spend their winter in Tucson. The next attraction was the acres of mothballed aircraft, ranging from C-130 transport planes to F-6 fighters and navy helicopters. This is the ‘largest aircraft boneyard in the world’ with more than 4400 planes stored on the base. The boneyard or graveyard is under the direction of the Aerospace Maintenance and Regeneration Center. The vast majority of these planes will never fly again, but are often used for parts and/or scrap metal. If interested in taking a tour of the boneyard, the Pima Air and Space Museum at the opposite end of the AFB is open to the public for a nominal fee. The golf course is average with wide fairways, some water hazards, and well placed bunkers and large trees. Yardage varies from 5,792 yards (forward tees) to 6,611 yards (back tees). The Course Rating is 70.6 with a Slope of 128. The best holes were the four Par 5’s, giving an opportunity for birdies. Bermuda grass is used on both the fairways and greens. This is a full service course, having a driving range, chipping area, putting green and PGA teaching staff. The Pro Shop is very well stocked and there is a comfortable clubhouse. The green fee was very reasonable, leaving a feeling of wanting to return.